A creamy, oil-free facial mask that helps skin drink deep overnight for a soft, dewy glow by morning. This rich, penetrating night mask helps skin drink deep to replenish lost moisture, building reserves for tomorrow. Recommended for all skin types, it soothes and nourishes to help skin stay hydrated all night long, allowing you to wake up to soft, dewy, glowing skin. We have pretty tame weather out here in California, but I amn't really a winter person, and there has never been a day in the past 3-4 months when I haven't had the heater on in my room/house. While I have been sitting all warm and toasty indoors, my skin has been paying the price with the low humidity in the air making it go really, really dry. My skin type is oily-combination, so you might think that being dry should be a welcome break - and it was for a while - but after about a month or so the dry lines on my forehead were starting to look just as bad as the blemishes (strangely, all the dryness in the world doesn't stop the pimples!). No amount of moisturizer was helping, and in desperation I turned to Clinique, and that's how I started using the Clinique Moisture Surge Overnight Mask. How to Use the Clinique Moisture Surge Overnight Mask: This is a bit different from what I am generally used to. 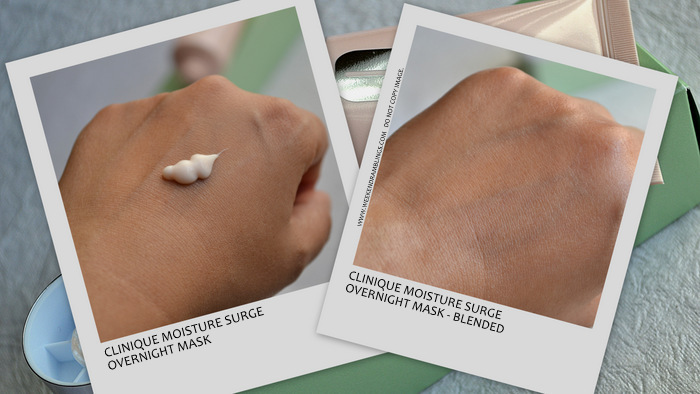 The Clinique Moisture Surge Overnight Mask is a thick, creamy, mask that as the name implies is left on overnight. I do my regular night-time face cleaning and then apply this mask, dotting quite a liberal/scary amount all over my skin and massaging it into the skin, and then I go off to sleep. Just like that - no peeling, scrubbing, washing, tissue off, nothing. Rather than calling it a mask, I should just call it my night cream. The texture is slightly thick and it does feel quite heavy and almost greasy, especially since I apply a LOTof it, but I don't bother tissue-ing of any excess. By morning, all of it is completely absorbed (no doubt, some amount does get transferred on to my pillow if I sleep right away), and I noticed a difference in my skin from the very first time I used this mask. No more dryness, my skin looks healthy and well-moisturized but without any added oiliness, and I have not had a single breakout because of this. It's very rarely that I stick to any kind of a skincare routine, but I have been so impressed with this mask that I have been using it every single day for more than a month now! I love the Clinique Moisture Surge Overnight Mask so much that I already have a backup, but is this the right product for you? My vague theory on how this mask works is that it uses a combination of hydrating, nourishing ingredients like mango oil, shea butter, etc., to moisturize the skin and a barrier agent like dimethicone to form a protective layer over the skin to prevent moisture loss. If like me, you have issues with the weather/lack of humidity in the air drying out your skin, this just might work for you too. On the other hand, if your skin is always/naturally dry (not related to weather) or if you are looking to erase lines that have been around for a while now or are looking for antiageing/wrinkle-reversing effects, this might not be the product for you. And no, this is not going to whiten/lighten/brighten/detan your face. Hope that helps! Overall, the Clinique Moisture Surge Overnight Mask is a fabulous product for skin that needs a moisture boost. It is easy to use - no washing off needed - and while I have acne-prone, sensitive skin, I haven't had breakouts or sensitivity issues with this product. Another plus point - I have been using generous amounts of this mask every day for more than a month now, and I still haven't finished the first tube that I bought - so you definitely do get a lot of product for the money. Hi Radhika ... how have you been?? Hii Eesha! Been/still busy with work :) I am not sure if this is available in India, though, and if you stay in an area with a lot of humidity, this might not make much of a difference.. I know Radhika... it has started getting warmer, read hot, here. But continuous exposure to AC dehydrates the skin. If not everyday, but twise-thrice a week should be great. This will be more helpful for me during winters. AC does dehydrate the skin! I definitely will give the Clarins Hydraquench mask a try..hope I get lucky with the samples..15 mL is quite a reasonable amount, isn't it? Yeah... 15ml is quite reasonable to try a new product. will keep this one in mind for the next winters. My skin is just the same - going from dry to oily depending on the temperature! I stay in Mumbai which has a terribly humid climate, so this product won't work for me. Also, I have oily and acne-prone skin. But my body skin is very dry for which I use coconut oil based creams. As coconut oil penetrates deep into the skin leaving it nourished and glowing, it works well for my skin. Me toooooo - face is oily and acne-prone and superdry skin. Totally agree with you on the coconut oil. It's really the best for dry skin, isn't it? rads me just readddddd me wnat so spensive but!!!!!!! and i love these kind of masks its like u put them on and they do some magic overnight. I have same skin type as yours and i well know how cali was when i was there. hai ram!